Will the Cloud have a Silver Lining for HR Outsourcing ? Organisations have had to respond to the seismic shifts in the economy with the increased use of contractors, zero-hours contracts, interim resources, partnership arrangements, consultants and outsourcing to weather the storm. This process has also been mirrored in the HR world as HR directors scrutinise how to source current skills needed to deliver HR services. Outsourcing started out as a necessity of 'doing more for less' and has increasingly become standard practice, with many organisations using outsourcing to drive efficiencies. However, before outlining why outsourcing might rise again, it is worth a quick refresher of its history and some of the lessons learned. The birth of multi-process HR outsourcing came about in the late 1990s as part of the first wave of HR transformation, the goal of which was to spend more HR time helping to deliver organisational strategy and less HR time on administration. The tactics deployed involved tools for managers to do more people management and restructuring HR based on economies of scale. These included HR shared services and tactical outsourcing, and economies of scale with business partnering and specialist HR teams. Some of the enablers of these changes adopted ERP technology, corporate portals as well as the emergence of a multi-process HR outsourcing industry. We all understood the logic of the first wave of HR outsourcing in 1999 – freeing up HR to focus on strategic aspects of the job. It is worth pointing out that outsourcing wasn't a new concept in HR, with most organisations already outsourcing their payroll as standard practice. It was this desire for HR transformation that created ground-breaking global HR outsourcing deals, with Exult-BP and ePeopleserve (Accenture and BT). The rationale for the 'buyer' organisations such as BP and BT was to use outsourcing to help drive transformation, including standardised HR services, reduced HR cost to serve and access to new innovations such as HR portal technology. The thinking behind HRO vendors such as Accenture and Exult (eventually bought by AON Hewitt) was to build up a large global client portfolio and benefit from labour arbitrage by offshoring work to countries such as India. The economic case provided a client with 15–20% savings and the possibility of making a 15–20% margin over a ten-year contract. A longer-term aim was to provide standard HR services using the same technology platform. 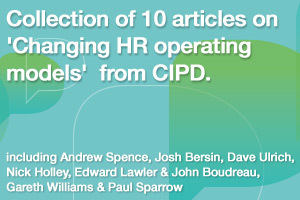 However, the problem was that each client was taken on in a different state of standardisation, with a different configured HR system, which meant that the service was very much tailored to that organisation and couldn't easily be shared with other organisations – in other words, the antithesis of standardisation. The results of this first wave of HR outsourcing were mixed for both client and vendor. As someone who was involved in one of the very first outsourcing projects, I found it exciting, but it caused many sleepless nights! I witnessed at first hand the trauma of moving the organisation to standardised services, HR service centres for clients and also restructuring HR with new roles such as business partners. The second big wave of change in HRO contracts came around 2006, including Unilever-Accenture and Johnson & Johnson-Convergys. These didn't quite deliver our dream of a standardised multi-tenant service enabling each client to benefit from new innovations either. Instead, these services offered bespoke solutions, tailored to clients' demands and meeting the particular nuances of their HR operating models. They had some success; according to industry analysts, Everest Group, the multi-process HR outsourcing market is worth about US$3.3 billion globally. Although the HRO industry consolidated, outsourcing contracts lasting a decade were thin on the ground when organisations couldn't see where they might be themselves. Single process outsourcing went from strength to strength, such as benefits administration, recruitment process outsourcing, payroll and learning. From my perspective working on both the client side and the vendor HRO side, there were a number of lessons learned in the first two waves of HR outsourcing. – How will outsourcing fit with your HR operating model and HR strategy? – Does your organisation really have the appetite to standardise HR processes and services? – Do you have required experience managing third parties? My view is that cloud will have a significant impact on HR and will help HR to deliver the original goal of freeing up time to focus on strategic imperatives. And outsourcing will play a big part in that for many organisations. Third wave of HRO – will the cloud give HRO its silver lining? There is a lot of excitement around technology as a driver for change, particularly in talent identification and development, and workforce productivity. HR continues to have challenging requirements, from finding future top sales performers to providing tools that monitor the performance of a global project team. There is now a relentless move to migrate HR systems from on-premise to SaaS (software as a service). A great benefit of an SaaS solution is avoiding the expensive and time-consuming customisation 'fudges', for example trying to get the system to map your exact paper-based performance management process. SaaS drives process standardisation because 'you get what you are given' in terms of functionality, and then configure it for your organisation. However, you still need to persuade employees to work differently. Cloud will force HR to become more standardised, requiring less centralised HR teams to maintain it and breathing life into the HR outsourcing market. The impact of cloud technology also gives HR some attractive outsourcing options, for example, move HR processes onto a standardised SaaS platform and outsource the management of the HR technology platform and HR administration. This combined offering of business process outsourcing and software as a service has been called BPaaS, or business process as a service. BPaaS offers standardised yet highly configurable HR services, allowing organisations to standardise transactional HR processes. The rise and rise of Workday, and others such as SAP's SuccessFactors, has stimulated the HR outsourcing market with NGA HR, IBM and AON Hewitt all with HRO contracts using SaaS. As SaaS forces HR to standardise, there is less HR administration needed, therefore the BPaaS deals so far have been smaller in size. The BPaaS model fits nicely with the new generation of agile HR operating models. So with the potential benefits of a new generation of HR outsourcing, how might this impact future HR operating models? To benefit, HR will need to learn from the past and execute a more standardised approach to the delivery of HR services. Software ultimately has to be used by us pesky humans. Good design, robust governance, communications, training and support are always needed irrespective of the next technological breakthrough. And with any outsourcing, the same questions need to be asked about how it fits with the HR operating model and HR strategy. – SaaS will automate many HR tasks; manual HR work will be reduced substantially. – There will be less need for HR service centres as cloud-based systems manage to support the move to self-sufficiency for managers. – There will be a new type of HR outsourcing which develops more around business consultancy services and specialist HR advice than service centres/manual processing. – More HR resources will be allocated to solving business problems. This entry was posted on Monday, March 23rd, 2015 at 1:57 pm	and is filed under CIPD, Future of Work, HR Operating Models, HR Outsourcing, HR SaaS, HR Shared Services, HR Strategy, HR Technology, HR Transformation, hro vendors, Leadership. You can follow any responses to this entry through the RSS 2.0 feed. You can trackback from your own site.